Before I get into my vocab word for the day I want to say thank you for the well wishers for Eddie! Ed had his surgery and is a little loopy from the drugs/anesthesia but he’s doin’ okay! 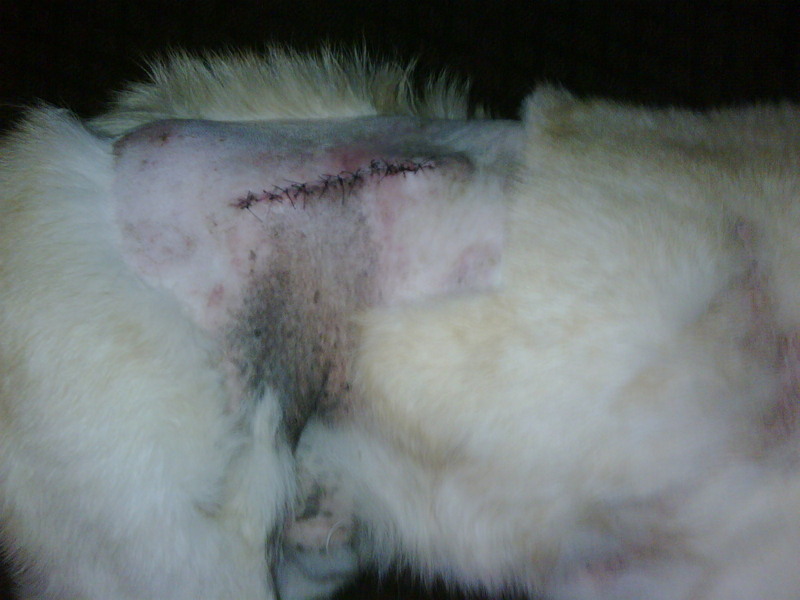 He had an open tumor so the vet cut around it and stitched it up. I want to talk about taste aversion. It is a concept I learned in psychology my senior year in high school. Taste Aversion: a type of learning formed after one trial, whereby an association is formed between feelings of sickness and (usually) a particular food, resulting in an avoidance of the food. Example: You go out to eat one night at your favorite restaurant and order eggs, like you always do. It turns out your eggs were undercooked. Crap. Hours later you are throwing up. One week later you go back to your favorite restaurant and just the smell of eggs makes you sick. That is taste aversion. Hi there. 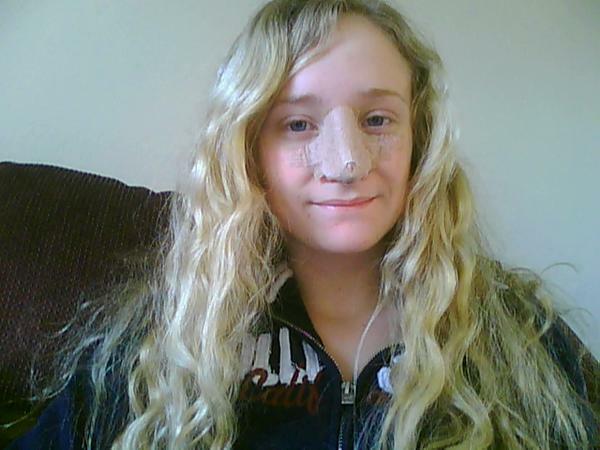 That was me in 2009 after major re constructive nose surgery. 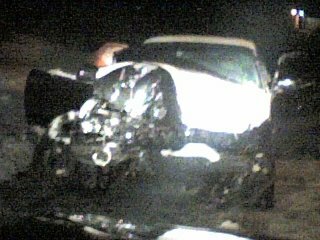 From a car crash. I developed a taste aversion after the crash. I hopped in Jim’s car while I was opening a Nature Valley pecan crunch granola bar. I was so content with eating my little snack that I forgot to put on my seat belt. Stupid me. We slid on ice and hit a tree head on. My face was crushed in the dash and my head broke the windshield. I sprained my wrist and knee and had a concussion. I was lucky to be alive. Right after we crashed I knew I was going to PUKE that granola bar. For some reason, I didn’t but I felt very sick to my stomach. Of course typical things happened after the accident: ambulance, hospital, surgery, etc. When I was finally feeling okay after the accident I decided to (slowly) get up and grab a snack! Why not a Nature Valley pecan crunch granola bar?! I took one look at the box and gagged. To this day, I still can’t think of those granola bars without feeling sick. Do you have a taste aversion?! That is so interesting! I used to have issues with anything grape flavored and would gag at the taste…due to me instantly throwing up grape dimetap cough syrup as a kid. However, my tastes have changed and now I love grape flavored things! Wow, how scary about the car crash! I’m so glad you made it okay! That is so scary and I’m so thankful that nothing worse happened! I have a taste aversion to eggs, which I cooked once when I was sick. Haven’t eaten scrambled eggs since and that was when I was 10 or 11. And I used to avoid pancakes like the plague ever since I ate terribly cooked ones (made by my little bro) that were liquid in the middle and tasted horrible. I still don’t like pancakes as much as I once did, although I did start eating them again. So glad your dog is alright! I’m with you on taste aversion – I can’t eat Lucky Charms (I ate them right as a stomach bug began in 3rd grade –> puked on teacher’s shoes) or Egg McMuffins (a homemade version was the last thing my dad ever ate 😦 ). Glad the only lasting effect of your crash was an aversion to that granola! Poor pup, hope he’s back to normal soon! I have a taste aversion to ginger ale after a friend’s mom gave it to me when my stomach was upset and I threw up anyway. I hope you can still eat pecans, they are too yummy to avoid! Wow, I’m so thankful you’re alive and well after such a gnarly looking crash, how scary 😦 I’m also glad your dog’s doing well in his recovery! I have a taste aversion to french toast, syrup, waffles, and pancakes…my friend’s dad made them all for us at a sleepover when I was a little kid, I ate way to much and hurled it all up. Ever since then, I can’t even be in the same room with the smell, yuck! I don’t really have any taste aversions- just combinations I don’t like. My mom made soup once that had beans and orange peel in it. It was BAD…I smelled it cooking all day and knew I would NOT eat it. Oh girl! I am so glad you were okay! I’ve never really had taste aversion, but my husband has! With sun dried tomatoes of all things. He had them in a dish from the Macaroni Grill and then got food poisoning. Hasn’t touched those since. wow, God really had angels looking over you in that crash! I have a taste aversion to waffles and peanut butter. Thats the last thing I ate before I got extremely sick from a gluten intolerance. I will no longer buy frozen waffles. Only bread or pancakes which are basically the same thing. haha. I have taste aversion to Thai food. I got sick from an unrelated cause the day after and cannot even stand the smell anymore. Sadly-it wasn’t bad food. I could see why you would be averse to those granola bars – what a bad association! I have a taste aversion to Red Lobster because after eating there with my family one night I got a viral infection that caused me to be super sick, like throwing up constantly, for almost 24 hours. It was awful! I can barely stand to drive past the place. Oh my – how scary that crash must have been!!! I can totally understand why you would have developed a taste aversion! gosh, i’m happy for you that you are perfectly fine now ..
On the bright side, I’m glad to hear Eddie is OK! I am glad your pup is doing okay! ANd I am even more glad you are okay from your crash.. because I LOVE to learn about your life and read your blog. So funny about your taste aversion. I feel like I have so many .. but can’t really think of any. The one I can think of right now is alcohol related from college. I went to Cancun on spring break.. and drank vodka and OJ the whole time I was there. The smell of the mixture – makes me vomit a little in my mouth ( not literally.. but you know ) .. I don’t even really like OJ anymore either! I have a taste aversion to Arby’s fast food and that’s pretty much it. I so, so, so hate on that happening to you. It pains me. It’s a good thing you did not develop a crippling fear like “car” aversion. Oh my god Allie, I’m sorry you had such a terrible accident. 😦 Yes, you were lucky that you still have life although you have this “taste aversion”… I never heard of it and it was interesting to read…but I’m just traumatized how scary and unexpected your accident was. Always wear a seat belt. You never know it can happen to me next. Oh my goodness I’m glad you are okay! I was in a rather serious car accident in high school too. Scary stuff! I have a taste aversion to jalepenos. When I was little, I got sick after eating cream-cheese stuffed, bacon wrapped, grilled jalapenos (I’m from Texas, that was a staple, haha). I can’t stand just the smell of jalapenos now.